Removable partial dentures usually consist of replacement teeth attached to pink or gum-coloured plastic bases, which are connected by metal framework. Removable partial dentures attach to your natural teeth with metal clasps or devices called precision attachments. Precision attachments are generally more esthetic than metal clasps and are nearly invisible. Crowns on your natural teeth may improve the fit of a removable partial denture and they are usually required with attachments. 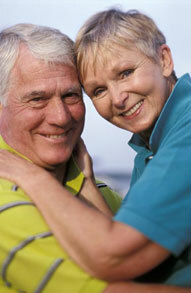 Dentures with precision attachments generally cost more than those with metal clasps. The denture process takes about one month and five appointments: the initial diagnosis is made; an impression and a wax bite are made to determine vertical dimensions and proper jaw position; a "try-in" is placed to assure proper colour, shape and fit; and the patient`s final denture is placed, following any minor adjustments. It's best to stand over a folded towel or a sink of water when handling your denture, just in case you accidentally drop it. Brush the denture (preferably with a denture brush) daily to remove food deposits and plaque, and keep it from becoming permanently stained. Avoid using a brush with hard bristles, which can damage the denture. Look for denture cleansers with the Canadian Dental Association (CDA) Seal of Acceptance. Pay special attention to cleaning teeth that fit under the denture`s metal clasps. Plaque that becomes trapped under the clasps will increase the risk of tooth decay. Hand soap or mild dishwashing liquid to clean dentures is also acceptable. Other types of household cleaners and many types of toothpaste are too abrasive and should not be used for cleaning dentures. A denture could lose its proper shape if it is not kept moist. At night, the denture should be placed in soaking solution or water. However, if the appliance has metal attachments, they could be tarnished if placed in soaking solution. Even with full dentures, you still need to take good care of your mouth. Every morning brush your gums, tongue and palate with a soft-bristled brush before you put in your dentures. This removes plaque and stimulates circulation in the mouth. Selecting a balanced diet for proper nutrition is also important for maintaining a healthy mouth.